Last week I offered myself a nice yoga retreat in the South of Belgium, in the midst of luscious nature relatively far away (to Belgian standards) from cities and civilization. Bird songs were accompanying us from dust to dawn and local, organically grown vegetables satisfied our daily appetites. During one of the lunch breaks I was sitting next to Marion at the table and at some point we came the subject of unconditional love. Then she showed me her bracelet that she found and bought in NY. 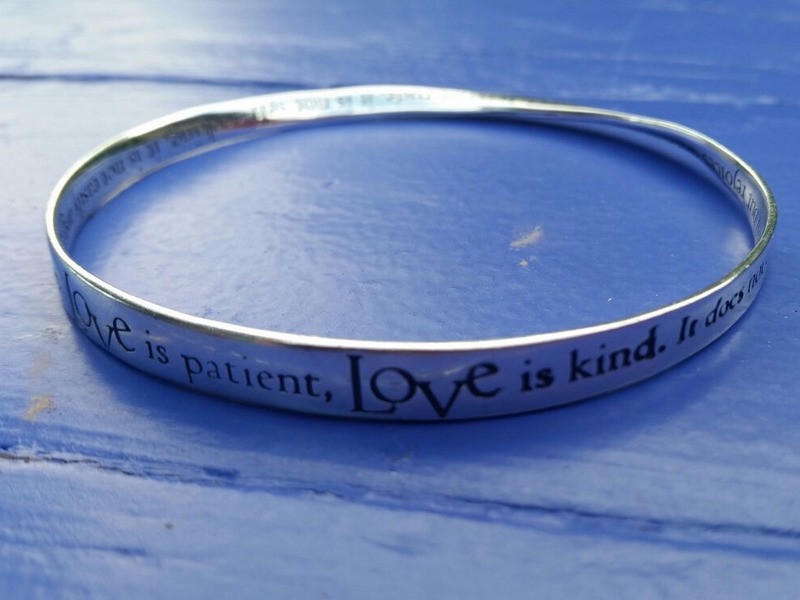 The inscription on the bracelet is a quote from the bible on love (Corinthians 13:4-7). I assume the author of this quote refers to agape. As agape is such a transcendent form of love that it is impossible to translate into words. In this quote a few words highlight some of the qualities of agape and there are even more words to describe what it is not. Or it rather describes what the symptoms are of the absence of agape. With Marion’s permission I filmed the bracelet and with her permission I share it with you here below.